KAMPALA – The meeting held between Deputy Speaker, Jacob Oulanyah and delegation from Romania that was meant to discuss diplomatic relations with the European nation took an ugly turn when he narrated his ordeal of how he was forced to walk with his luggage for one kilometer because the building he was headed to was hosting ‘big people’. It should be recalled that Oulanyah represented Parliament at the 53rd Session of the African Caribbean and Pacific (ACP) Parliamentary Assembly in Bucharest last month, Romania but details of his ordeal were only made public where he asked the Romanian Government to clean up their system when it comes to dealing with visitors to their nation. While kicking off with his comments, Oulanyah said there was a need for him to be candid about the issue of the first impression because he is a politician, not a diplomat and unlike diplomats who say things politely, a politician says things directly. The Deputy Speaker said that he spent 15-20 minutes on the road trying to persuade the Romanians to allow me go in with the car and efforts of his female Romanian driver who tried to talk to the Romanians fell on deaf ears too. “They didn’t barge, I had to push my luggage for 1Km. I was very unhappy. I raised in in the council meeting and told them this isn’t the way you treat people and a lot of people had their experiences. This is something you need to clean up,” Oulanyah said. Daniela Gitman, Ambassador at Large Special Representative for UN Affairs apologized on behalf of her nation describing Oulanyah’s treatment as a misunderstanding saying his treatment wasn’t as a result of bad attitude and conduct among Romanians but the big mistake on the protocol side. The team had paid a courtesy call on the Deputy Speaker ahead of the 50years celebrations of bilateral relations between Uganda and Romania with Gitman arguing that the meeting was aimed at seeking for new avenues on how to enhance and make the relations more dynamic after the relationship having gone cold in the recent past. 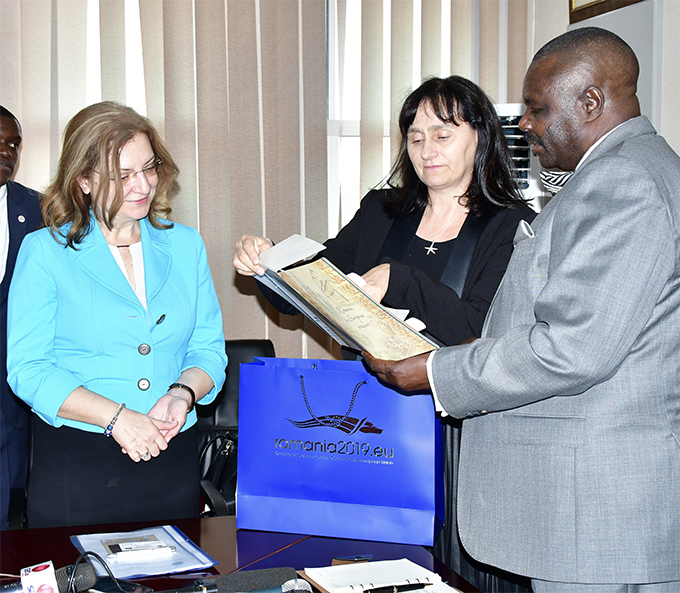 Among the areas Romania is seeking relations with Uganda are Education where the two nations will agree on mobility between students and academia; agriculture, Information, and Technology, cybersecurity among others.